Have you upgraded to macOS Mojave yet? 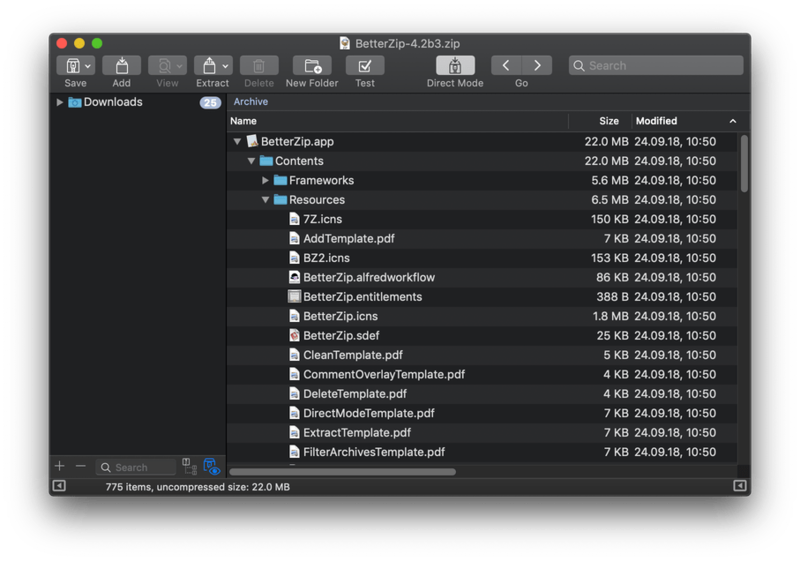 Then you really need BetterZip 4.2 which adds support for the new Dark Mode. I am rather a Light Mode guy, but to each their own and BetterZip no longer shines a bright white window into your sore eyes, if you choose. The new version also brings some big new features and enhancements to existing ones. Added support for macOS 10.14 Mojave’s Dark Mode. BetterZip now has a menu bar icon onto which you can drag items and that has a shortcut menu with the most important functions. Activate the menu bar icon in the BetterZip preferences on the tab “General”. You can now specify in extraction presets what BetterZip should do, if there are conflicts with already existing files or folders. Added an option to not “show folders” when in flat list view. Toggle this option via the View menu. Added a Polish translation. Thank you, Bartosz! Filenames containing numbers are now sorted numerically like in Finder. The “Replace File” dialog shows more clearly which file or folder is older and which is newer. Changed the logic of the option “Quit after last window closed”: only archive windows will trigger the quitting, not the preferences, transcript, or queue windows. Show combined progress of all windows (not only queue) in Dock tile (and menubar item). Added a button for testing the archive in the warning message window when an error occurs during opening. Added an AppleScript command to get the selected item paths in an archive window. The Drop Bar is now forced to the front when dragging files over it. Add a setting to not show the queue window when queue operations are started. Turn it on in BetterZip > Preferences > Advanced. The encoding of text files is now automatically detected when previewing text files in the preview sidebar. You can now select multiple files in the File > Open panel. Dropping files (especially a mix of supported archives and non-archive file types) onto the BetterZip Dock icon did not work reliably. When switching view mode without a sorting column selected in the table, BetterZip could crash. Fixed the opening and extraction of plain xz archives. For some users the BetterZip Finder button did not work. Extracting multi-part, password protected rar archives with CRC errors could lead to an endless password entry loop. When editing a file type in Preferences > Files and clicking Ok without making any changes in the window, the type disappeared from the list. PDF files showed only the first page in the preview sidebar. Compressing a folder with a space character at the end of the name didn’t work.